Three years after his pitching helped the Cardinals to a National League pennant and World Series title, Jim Kaat used his skills as a talent evaluator to help St. Louis to another championship season. 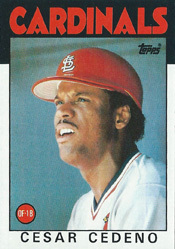 Kaat, a left-handed reliever for the 1982 champion Cardinals, was a coach for the 1985 Reds when he recommended to St. Louis manager Whitey Herzog that the club acquire Cesar Cedeno from Cincinnati. Acting on Kaat’s advice, the Cardinals got Cedeno from the Reds on Aug. 29, 1985, for minor-league outfielder Mark Jackson. The deal rejuvenated the Cardinals and Cedeno. Filling in for injured first baseman Jack Clark, Cedeno batted .434 (33-for-76) with six home runs in 28 games, sparking the Cardinals to the 1985 NL East Division title and onto a path to a pennant and a berth in the World Series. With the Astros from 1970-81, Cedeno batted .289 with 343 doubles and 487 stolen bases. He won the Gold Glove Award five years in a row (1972-76), was named an all-star four times and twice led the NL in doubles. The Astros traded Cedeno to the Reds in December 1981 for third baseman Ray Knight. By 1985, Cedeno, 34, had fallen into disfavor with Reds manager Pete Rose. Cedeno, eligible to become a free agent after the 1985 season, said he expected to be traded. He’d heard the Blue Jays were interested. The Cardinals, meanwhile, were in Cincinnati for an Aug. 26-28 series with the Reds. Kaat, who pitched for St. Louis from 1980-83, and Herzog met for breakfast. The Cardinals and Reds arranged a deal. When the trade was made, the Cardinals led the second-place Mets by 2.5 games. A right-handed batter, Cedeno had hit .241 in 83 games for the 1985 Reds, but the Cardinals saw him as a capable candidate to platoon with Mike Jorgensen at first base until Clark, who had suffered a rib injury on Aug. 23, could return to the lineup. The trade paid immediate dividends. On Sept. 10, the Mets beat the Cardinals at New York and moved into first place in the NL East, a game ahead of St. Louis. The next night, Sept. 11, produced a matchup of aces: Tudor vs. Dwight Gooden. Both were sharp and the game was scoreless through nine innings. In his month with the Cardinals, Cedeno hit .528 (19-for-36) at home and .541 (20-for-37) against left-handers. He had a .477 batting average (21-for-44) with runners on base. Cedeno further endeared himself to Cardinals fans by shredding Cubs pitchers at a .560 clip (14-for-25) with nine RBI. It was a different story in the postseason. Cedeno hit .167 (2-for-12) in the NL Championship Series versus the Dodgers. Playing in his only World Series, Cedeno batted .133 (2-for-15) against the Royals. In March 1986, Cedeno signed with the Blue Jays, got released before the season began and was picked up by the Dodgers, who released him in June. A month later, he signed with the Cardinals and was sent to Class AAA Louisville. Cedeno hit .169 in 20 games for Louisville and never returned to the big leagues. that 1-0 extra inning win on the homer at new york was probably the biggest victory of the season. put cards back on top to stay i think instead of 1.5 back. i remember listening to that tense game on the radio; i seem to recall it was pulled down the left field foul line just fair. cedeno was awesome in september but cooled off in october, unfortunately. tudor’s 1985 season – 21-8, 1.93 era, 10 shutouts – would be good enough to win the cy young most years. started 1-7, then went 20-1. Thanks for the insights. I agree that the 1-0 win on the home run by Cesar Cedeno was key to keeping the surging Mets from getting the upper hand in the 1985 division race. That 85 team was a blast. What fun it was living there and going to games at Busch. Cedeno was a major spark plug. Great addition and Whitey was dead on with his thoughts on getting him from the Reds. I can still see that team: Porter, Clark, Herr, Ozzie, Pendleton, Coleman, McGee, Van Slyke, Cedeno, Landrum, Jorgenson, Nieto and more. Pitching was great with the big 3: Tudor, Andujar and Cox. For school and Kepshire supported the excellent bullpen by committee. Thanks for the great memory jogger. Reminds me of great times as a teenager in St. Louis. Always love the stories, Thank You! Tim, I share your passion for that team. Thanks for the fun feedback. LOVE this website! Cant thank you enough for all the great memories… and all the new knowledge!! Some stories bring tears to my eyes! SIMBA was always my favorite! Im 47 years old and had his posters in theb70s! Thank you, Jamie. I appreciate your support and readership. What great memories! Even though they fell short in the Series, that squad will forever be my favorite. Cedeno’s contributions, McGee’s MVP, Coleman’s ROY, Tudor’s amazing season, over 300 stolen bases as a team, epic postseason homers by Ozzie & Clark. My goodness, what a team! I’m convinced that 1985 & 2004 were the two best Cardinals teams of my lifetime. Thanks for the comments, Pete. Those 1985 and 2004 Cardinals teams indeed were loaded with talent and were fun to watch.